This past weekend I had the pleasure of riding Los Gatos Road. The mention of this road strikes fear in every cyclist who comes upon it. It should! 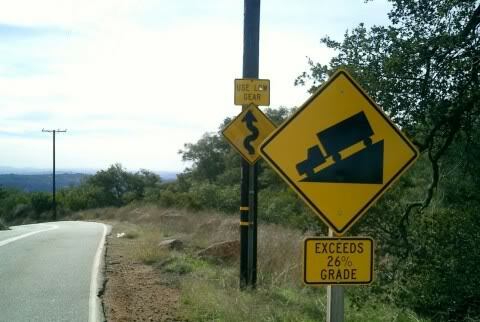 The 1.1 mile long section of road has a grade of 20%-28%. There are no breaks along this section for the legs or lungs to rest unless you get off and walk. As I made my way up this beast of a climb, I realized there are three vital tips I use to reach my goals when it comes to cycling and fitness. These three tips are also necessary in our relationships. Sitting at the bottom of the climb one thing that is imperative is your mental preparation. This is the point where you’re saying, “I’m going to make it up this beast!”, “One pedal stroke at a time”, or “It’s mine!”. You are envisioning yourself moving you and your bike up effortlessly. Once you are on the climb, it is the encouraging words that keep you going. These words may come from within, “I can do it”, “Keep it up”, or “Come on!”. They may also come from the other riders around who are cheering you on. When you reach the top, it’s time to celebrate the accomplishment. High fives, pats on the back and hugs are customary after such an endeavor. They should be given and received. You earned it! Mental preparation is necessary each day when we get up and out of bed. You need to put your mind in the right place so that you can have the relationship you want that day. Just like exercise, our relationships need our mental preparation to excel and succeed. One thing that happens in every gym, bike ride, group run, or workout is the use of encouraging words. We are working toward our goals, and it is wonderful when someone notices our effort. These same encouraging words can be used every day in our relationship. Make sure you use them with your partner each and every day. You’ve mentally prepared, received and given encouraging words, and now it is time to celebrate your accomplishment. This could be an evening alone, dinner and a movie, or a number of other things. Please don’t skip this one! This is where we get to bask in the glory of the goal we set before us. You may never climb Los Gatos Road, but every day you have your own road to climb. Make these 3 tips a part of your everyday life and you’ll succeed in your personal challenges and your relationships. What’s your Los Gatos Road?